On the anniversary of the collapse of the World Trade Center, Avenue des Arts inaugurates an exhibition asking questions on the world of the 21st century. In recent years, the world has vacillated between crises, crashes, regime dismantling and innovation, pleasure, excessive consumption; between euphoria and dismay. The objects supposed to satisfy our desires have enslaved us in the end. From medicine to mobile phones, everything has taken an addictive turn. Avenue des Arts opened its first gallery in Hong-Kong in December 2013. Located on the 12th floor of the Hollywood Centre, in the heart of Sheung Wan, the gallery showcases solo exhibitions of emerging and established artists from all over the world. The majority of artists that we represent are French, but we also include pieces from American, Brazilian and New Zealand artists. We are offering you a chance to discover artists who work with various forms of media, from oil paintings, to sculptures, and photos. Amongst them are works by Marcos Marin, Aurèle Lostdog, Nathalie Decoster, Gregory Berben, Nasty, Rubem Robierb, Mozart Guerra, Paul Milburn and Jeff Callec. Brazilian made, fine-arts photographer…south American / Miami style with New York edge. As an Artist, Robierb focuses on the contemporary society, making emphasis in the sociocultural issues that define our current times. He also focuses in the human figure, and the different aspects that reveal the human body language. His approach to photography is rather edgy, political, ironic and critical, and for that very reason, quite motivating. Robierb is keen on photographing all sorts of people, objects and scenes around the world with its different shapes and ethnicities. He intertwines images in a critical way giving his personal vision of our contemporary world. Sometimes, his work are very minimal, eliminating all superfluous details; other times his photographs mix in a kind of collage, as a result of the combining his own images to explosive colors and external subjects. He defines his photographs as SHARP and BOLD, but they are rather provocative and disturbing, conforming an ironic statement mixed with a harmonic beauty. Born in 1966, Tehos, French visual artist and abstract painter has explored techniques and materials for several years before expanding his work to digital arts, videos, and sculptures. 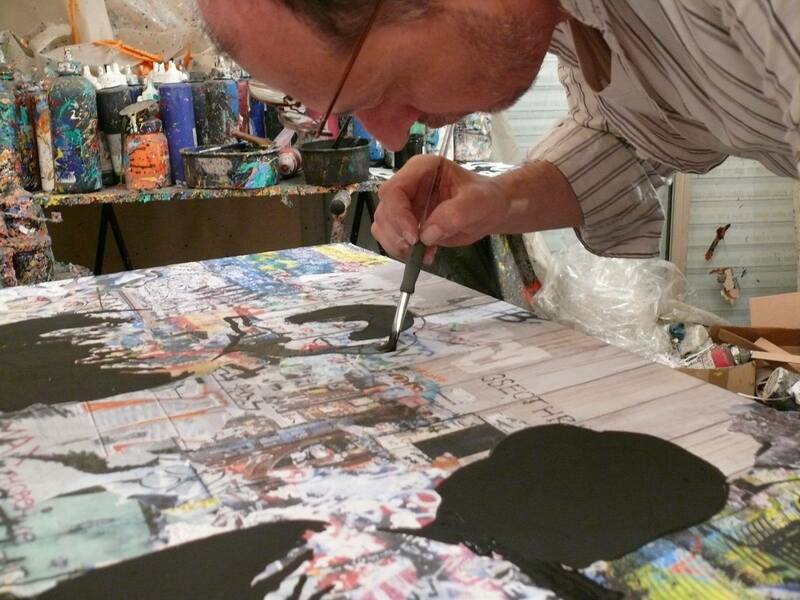 Between 2005 and 2012, he achieved more than 2500 paintings shipped worldwide.He quickly became known in the French and european arts market where he regularly exhibits his work.In 2007, he started a series of paintings based on torn papers, collages. 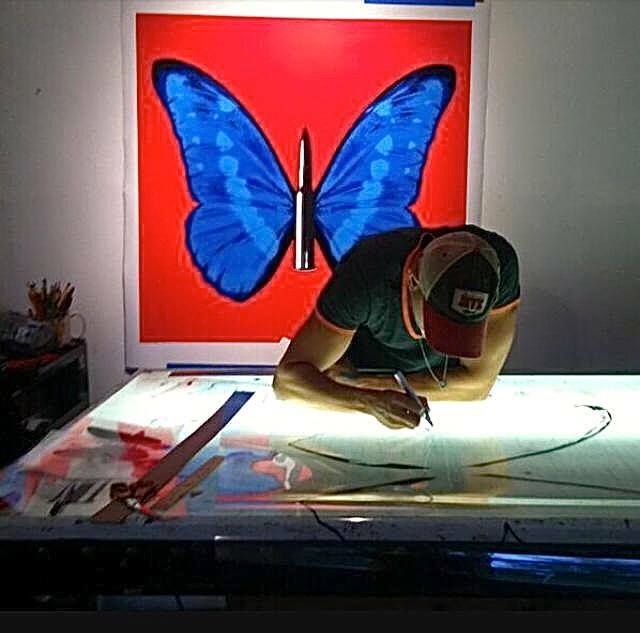 He has explored different themes and trends in journalism, fact-based articles that he used and transcribes on his canvases.